HeidelbergCement is in the process of extensively modernising its cement plant in Burglengenfeld, a project that will continue to 2018. In the course of this work, A TEC GRECO was contracted to install a kiln burner within the existing 1970s kiln line. The scope of this project included the engineering, design, and manufacturing of a tailor-made combustion system, as well as the required peripheral systems for an efficient and reliable operation. The respective kiln line has a capacity of 2000 tpd of clinker. 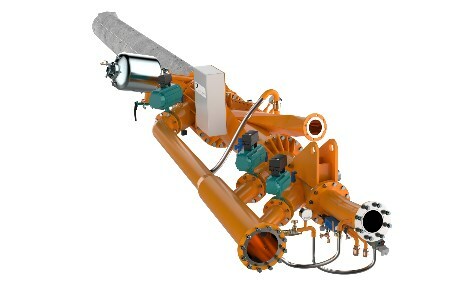 The unique axisymmetric design of the A TEC GRECO burner, which uses three airflows, allows optimisation of the combustion process and, therefore, maximising alternative fuel injection. The burner has a maximum combustion performance of 75 MW and is suitable for lignite, sewage sludge, RDF, diesel, and solvents. During the commissioning it was tested successfully with 100% lignite and a mix of fluff (60%) and lignite (40%). Individual adjusted momentum air flows outside, while inside (dispersion air) the burners, gaseous and solid fuel channels are responsible for mixing the primary air, secondary air, and fuels, to ensure a fast and stable ignition. Dispersion air, with its radial direction, creates a swirl effect, which gives the flame a high stability (providing superior flame control) and results in rapid flame formation (flame ignition point close to the burner). Through simple procedures, such as as natural gas and airflow regulation by valves, kiln operators can optimise firing conditions. Kiln process studies combined with burner optimisation measures have shown that the fundamental combination of lower primary air rate and higher momentum (higher primary air pressure) has the beneficial effect of reducing the NOX generation. The setting of the radial air channel (dispersion air) has a significant influence on NOX emissions. The burner observably reacts to a reduction of the internal recirculation zone with a decrease in NOX generation. Alternative fuels, with their water content, may decrease the flame peak temperature due to the necessary demand of evaporation energy, which results in a further decrease in NOX emission. A TEC GRECO also supplied an overhead, motorised burner trolley with a specific system to ensure the adequate positioning of the burner into the kiln, on the axial, vertical and horizontal planes.